Cerro Paranal, the 2600m high mountain in the Chilean Atacama Desert that hosts ESO's Very Large Telescope, will be the stage for scenes in the next James Bond movie, "Quantum of Solace". Looking akin to Mars, with its red sand and lack of vegetation, the Atacama Desert is thought to be the driest place on Earth. Cerro Paranal is home to ESO's Very Large Telescope (VLT), which, with its array of four giant 8.2-m individual telescopes, is the world's most advanced optical observatory. The high-altitude site and extreme dryness make excellent conditions for astronomical observations. "We needed a unique site for a unique set of telescopes, and we found it at Paranal," said Andreas Kaufer, ESO's Paranal Director. "We are very excited that the Bond production team have also chosen this location." The excellent astronomical conditions at Paranal come at a price, however. In this forbidding desert environment, virtually nothing can grow outside. The humidity drops below 10%, there are intense ultraviolet rays from the sun, and the high altitude leaves people short of breath. Living in this extremely isolated place feels like visiting another planet. To make it possible for people to live and work here, a hotel or "Residencia" was built in the base camp, allowing them to escape from the arid outside environment. 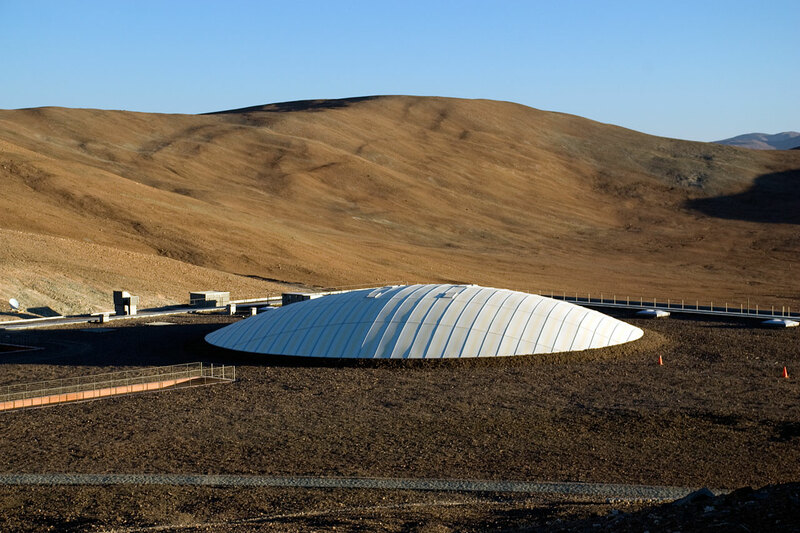 Here, returning from long shifts at the VLT and other installations on the mountain, they can breathe moist air and relax, sheltered from the harsh conditions outside. The Residencia's award-winning design, including an enclosed tropical garden and pool under a futuristic domed roof, gives its interior a feeling of open space within the protective walls - this is a true "haven in the desert". It is this unique building that serves as the backdrop for the James Bond filming. QUANTUM OF SOLACE producer, Michael G. Wilson said: "The Residencia of Paranal Observatory caught the attention of our director, Marc Forster and production designer, Dennis Gassner, both for its exceptional design and its remote location in the Atacama desert. It is a true oasis and the perfect hide-out for Dominic Greene, our villain, whom 007 is tracking in our new James Bond film." In addition to the shooting at the Residencia, further action will take place at the Paranal airstrip. The film crew present on Paranal includes Englishman Daniel Craig, taking again the role of James Bond, French actor Mathieu Amalric, leading lady Olga Kurylenko, from the Ukraine, as well as acclaimed Mexican actors, Joaquin Cosio and Jesus Ochoa. This cast from across Europe and Latin America mirrors the international staff that works for ESO at Paranal. After leaving Paranal at the end of the week, the film crew will shoot in other locations close to Antofagasta. Other sequences have been filmed in Panama and, following the Chilean locations, the unit will be travelling to Italy and Austria before returning to Pinewood Studios near London in May. QUANTUM OF SOLACE will be released in the UK on 31 October 2008, and in the US and internationally on 7 November 2008. Visit the new Bond at Paranal website.